Explore Melbourne’s vibrant and fascinating maze of lanes and arcades which have propelled Melbourne into a local and international attraction voted seven times the most livable city in the world. Our tours are personalised to your interests including by arrangement at a time and date of your choice. We blend different themes into our walks to provide a personalised experience such as street art, heritage icons, architecture, retail and hospitality, unusual and hidden places, gold rush, iconic characters and the evolution of the lanes system. And great stories! If you have a special interest area just let us know! Our places are carefully chosen to the tell the Melbourne Story from settlement to boom to interwar to post war migration to the rise of the most Liveable City. We provide maps, chocolate and historic souvenirs. Our tours usually start from Federation Square and are up to 2.5 hours (or whatever length suits). “Thanks everyone for a terrific day yesterday exploring the interesting but often overlooked side of Melbourne. I think everyone learned something new and we were all delighted to learn that the Coles ghosts have assured us that next year’s bonus is already a done deal! Thanks so much to our terrific guide whose enthusiasm and passion for Melbourne shone through in all of his stories and trinkets shared with the team!” The Team . I just wanted to say thank you for the (corporate) walking tour on Wednesday. I’ve spoken to a number of people from the group and they all could not speak highly enough of you and the tour content. They all thoroughly enjoyed it and learnt a lot about our city….even the locals! So thank you again and I’ll definitely keep your details on hand for the next time we have international visitors.’ Michelle. Every lane we choose tells an important story about Melbourne today and past. Robert Hoddle designed Melbourne’s street map in 1836 but refused to include lanes – he saw them as detrimental to the respectable establishment. 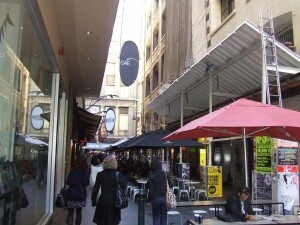 Melbourne’s little laneways evolved to create access to buildings during subsequent population explosions such as the gold rush. Some were later roofed as arcades to provide refuge from the weather and crowds and to provide more space for shops. The lanes therefore symbolically and practically are the ‘People’s Melbourne’. In the late 1990s the lanes became the key strategy for Melbourne’s successful reincarnation as the ‘most liveable’ city in the world. The approx 200 lanes are rated by the city according to their heritage values. It can be a life-long journey exploring all of Melbourne’s ever-changing lanes . Video: Melbourne Laneways by Eleni Arbus of Creative Spaces, Melbourne Council.